Fun with the DDR Five Year Plan! I like finding a topic to investigate that involves easily available stamps! 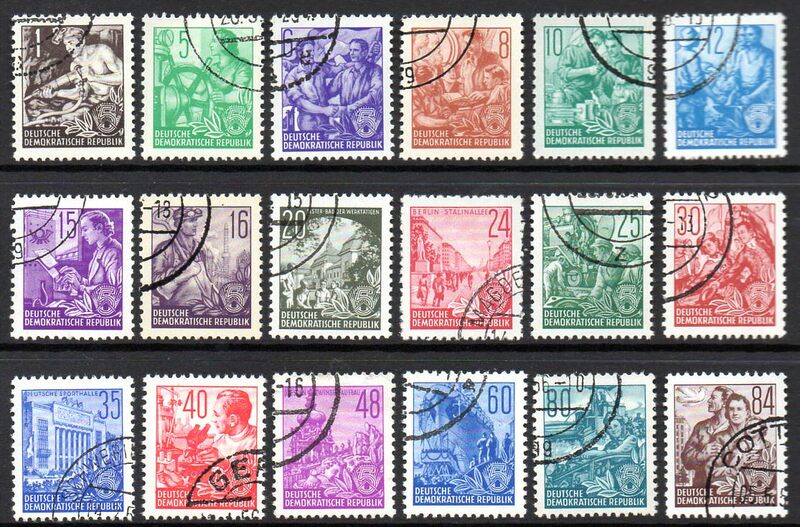 Here's one that I've left waiting for years in my stockbooks - the East German (DDR) Five Year Plan series first issued in 1953. To put it politely these stamps have a mixed reputation with most of the stamps on the market being unissued reprints with CTO cancellations. However, even the 1957 reprints are now over sixty years old so let's give them some attention. The so-called "reprints" actually used a slightly different set of designs. In each case the word DEUTSCHE (German) at the bottom left was formatted in the reprints to take up slightly less space. I guess this was to make the word stand out from the rest of the design. This change reflected the design used in the typo versions. In the original stamps the last "E" of DEUTSCHE appears appears above the letters "AT" of the line below. in the reprints this "E" lies directly above the "A". Perhaps another member could share more of these with us? There were two cancellations used for each of three of these cities and a number of different dates were used. In all there are 42 different postmark/ date combinations. So I guess if all these 42 were used on all 18 stamps, then there are 756 reprints to collect just from this dotted background set! All the cancellations are double circles apart from the one for GERA which is the "bridge" type with two lines across the middle, cutting a gap through the inner circle. Here are some examples from Cottbus, Dresden, Gera, Karl-Marx-Stadt (Chemnitz), Magdeburg, Potsdam, Rostock and Schwerin. 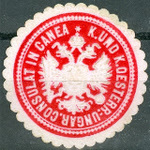 When the later stamps with lined backgrounds were surcharged the authorities accidentally surcharged some of the 24pf stamp from this set as well. They then reissued the stamp (but in a different shade) and then reprinted this stamp as well. The original surcharged stamp in the original shade is rare but the reissue and reprint are very common. That's all from me on the dotted background stamps. Next time I plan to look at the lined background typo stamps. Bis bald! There used to be an excellent guide to these posted on Jay Carrigan's website, but his site lapsed following his death. You can still access it via the Wayback Machine here. I used to enjoy browsing Jay's web site and even more, of course, reading his posts on another board. You learn something new every day. 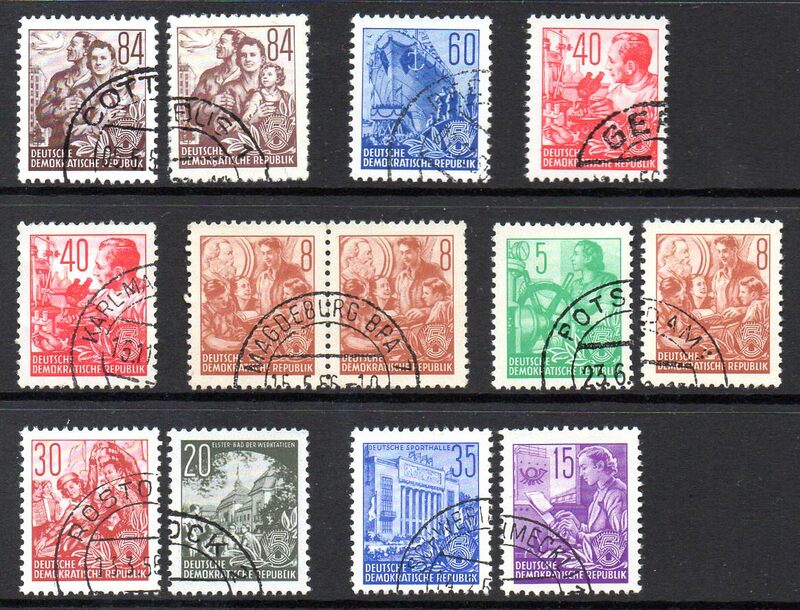 I didn't know those 1957 reprints were not officially issued - well, I probably never exactly pondered it because until recently I never saw more than a handful of postally used DDR stamps. Were the overprinted ones just there for misdirection, too, like to make people think these were being used for postage by somebody? I never realized that the 5 stood for Five Year Plan, either. If I thought about it at all, I thought it was the 5th anniversary of the declaration of the DDR or something. "Stalinallee" sounds like an incredibly sinister place. Has anyone here seen the German film, Good Bye, Lenin! ? I recommend it. I found it to be one of those films that you get drawn into and start reading the English subtitles without realising it. Wikipedia calls it a "tragicomedy" which sums up the humour and sadness of the film. It's all about a family in East Berlin around the time of the collapse of the DDR. 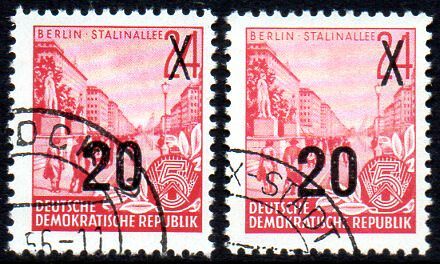 I'm reminded of it now as many of the scenes were shot in the street Karl-Marx-Allee which was the former Stalinallee shown on these 24pf stamps. 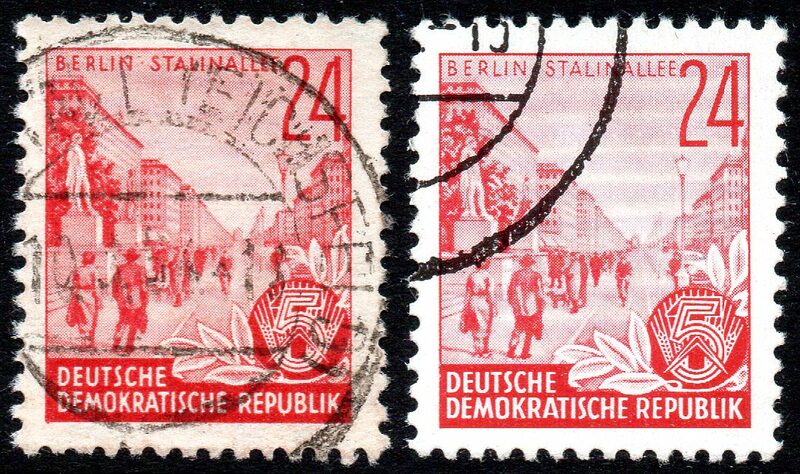 The Berlin Stampfriends Youth has also a "navigator" to identify these stamps.